This was a special one. 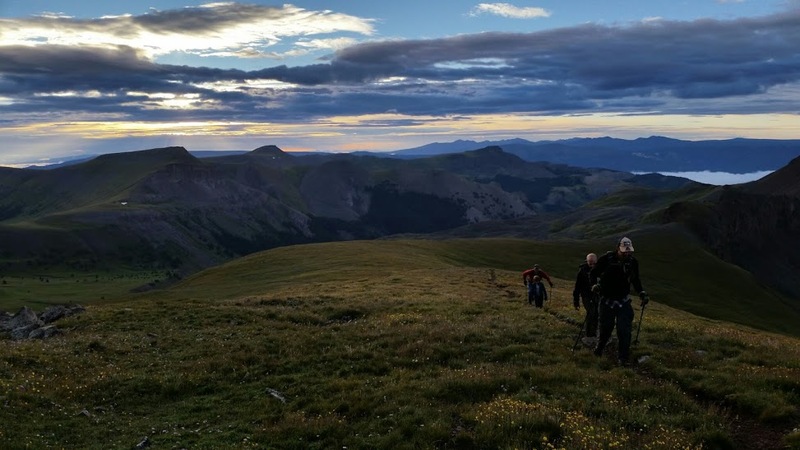 Originally we had planned to hike Uncompahgre Peak to celebrate the life of our dear friend Rob who had passed away 10 months prior. Plans for his parents to come down for the hike fell through at the last minute but something special happened a couple of weeks prior to the hike. Instagram provided me with the opportunity to do some good in this world (who knew instagram could be so influential?). I came across a group called the Colorado 54, which is an organization that raises money and awareness for providing clean drinking water to impoverished families in countries around the globe. 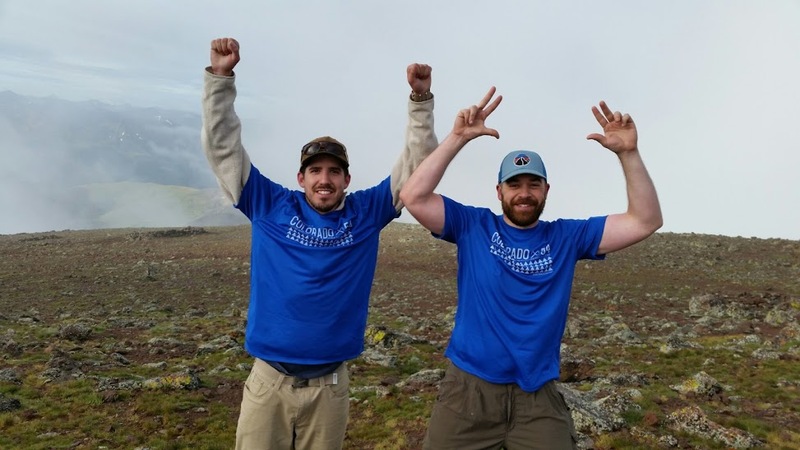 The goal for the organization is to hike all of Colorado’s 54 14ers in one day (so you’re telling me I get to help the less fortunate by doing something I love??). Way too cool, sign me up! August 7th rolled around and Boden and I were off, heading east out of Durango towards Lake City. Four hours and a few SKA beers later we were at the turn off for the Nellie Creek road. This road gets super gnarly fast and requires a high clearance 4×4, something my old explorer probably couldn’t handle. We had met another buddy, Matt, who had taken his lifted jeep wrangler over engineer pass. We hopped in with Matt, cramming 4 grown men and two kids into a 5 person jeep, this drive was going to be fun. Four miles and a couple more SKA beers later we arrived at a campsite which was about a 1/4 mile from the trailhead. 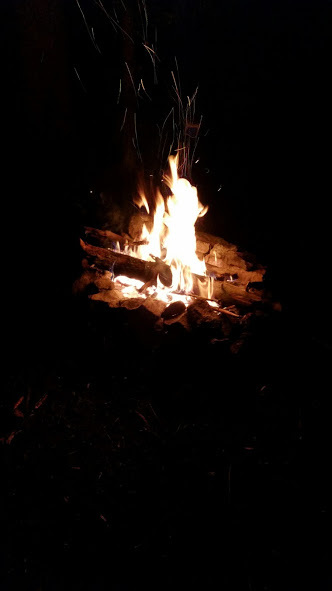 Tents were set up, a fire was started, and you guessed it, more SKA beer and whiskey was consumed. Alarm clocks were set for a 4:30am wake up call in preparation for a 5:00am departure time. It’s really easy getting up early as long as you’re not getting up for work. 4:30am: Head lamps on, packs filled with food, water, rain jacket, and fleece – go time. 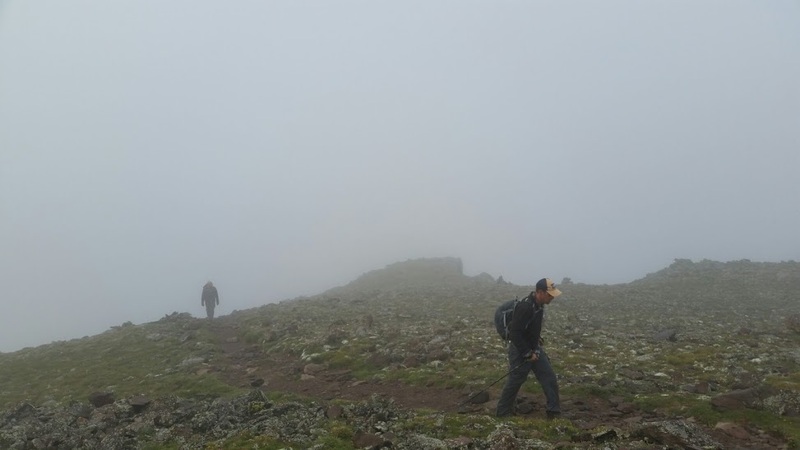 The trail is really well maintained thanks to the CFI (Colorado Fourteeners Initiative), a group that employs volunteers who regularly spend time clearing and improving 14er trails around Colorado. The trail switchbacks early on, bringing you to the upper basin and giving you your first glimpse of the 6th tallest mountain in Colorado (14,309ft). About 30 minutes in to the hike the sun started to cast its first light over the San Juans. 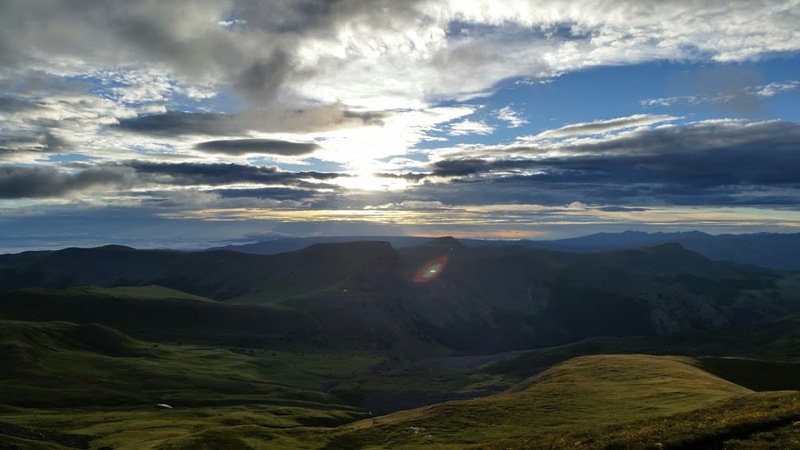 This hike is very doable for 14er first timers as it climbs 3,000ft over 3.5 miles, which is very mellow when it comes to 14ers. 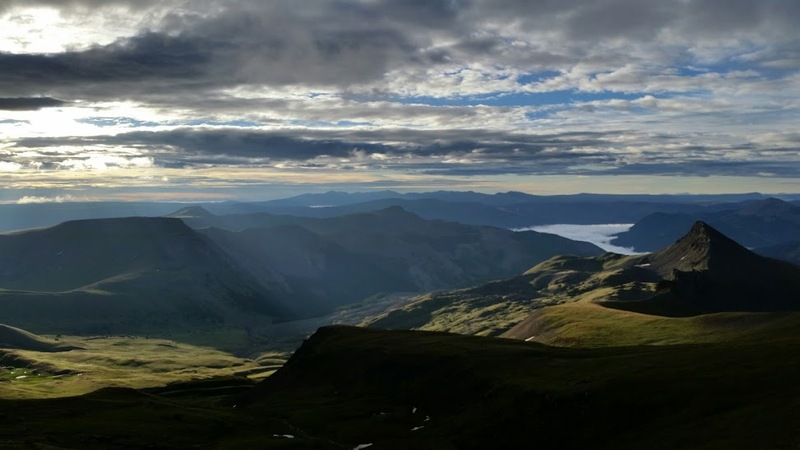 The Uncompahgre Wilderness area is one of the most expansive and beautiful areas in my opinion and located in the heart of the San Juan mountain range, the views are unbeatable. One of the reasons we start our hikes so early is to beat the weather and to make sure we are either off of the mountain, or at least on our way down no later than noon. Storms in the mountains don’t mess around and until you’ve had the chance to experience a lighting storm above tree line at 12,000ft, when you’re the tallest object around, it’s easy to underestimate. I’ve made that mistake twice and hope to never make it again. Believe me when I say it, it’s no fun. The second reason to start early is you get to watch the sunrise and there’s really nothing better than watching the sunrise over the rocky mountains (Kansas sunrises are great and all but it’s hard to beat views like this). 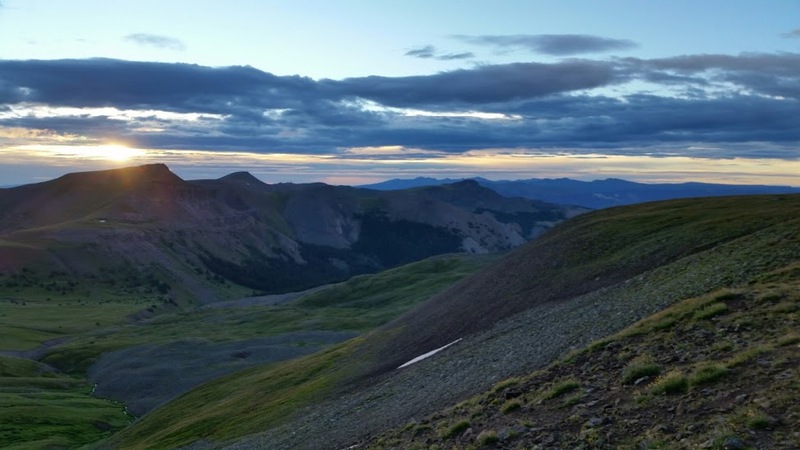 Uncompahgre Peak dominates the surrounding landscape, towering over the surrounding 13,000ft peaks. Looking up at the peak is a little daunting at first, but keep trekking and in a short time you will top out on the south east ridge. 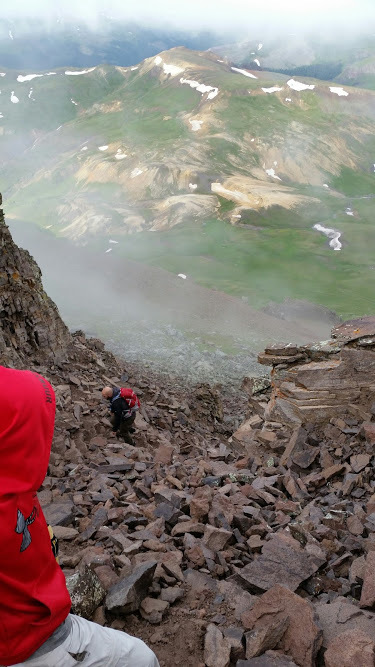 Once to the ridge, the true beauty of the Uncompahgre Wilderness is revealed and you are rewarded with views of nearby14,016ft Wetterhorn Peak (trip report coming soon) and 13,589ft Matterhorn Peak. The views on this hike are simply amazing. At this point the hike begins to get a little tougher and the terrain a bit steeper. The trail switch backs and dumps you onto the south face. There was a 50% chance of rain that day and although we didn’t get rained on we were socked in by clouds from this point on. Once you make the turn to the southern side of the mountain the trail heads back north and wraps around some rock outcroppings. If you’re feeling daring, you can scramble up the loose rock outcropping. This route requires a couple class 2+/3 climbing moves and makes the hike a little more interesting. We chose the later of the two options. It’s a walk in the park to the summit once the loose steep rock scramble is behind you. Unfortunately for us the clouds were concealing all of the beauty around us. It’s an eerie feeling being on top of a mountain and not able to see 50 feet in front of you. The summit was cold and windy, but there were a few moments when the clouds cleared and the basin below us was revealed. Boden and I snapped our summit photo w/ our sweet new Colorado 54 shirts. It felt good to accomplish something in the name of helping others. We chatted with two other guys at the summit for a brief time, ate some food, drank some whiskey, and headed down. From start to finish this hike took us about 4 hours, 2.5 hours up and 1.5 hours down. Once back at our camp we packed up and loaded back into the jeep for the 30 minute ride back to Henson Creek road. We all met back in town at Poker Alice, a pizza joint in Lake City. Food never tastes as good as it does immediately following a hike. Boden and I jumped into his trusty old Subaru and headed back for Durango. Luckily I still had a couple SKA beers waiting on me for the ride back. This hike marked my 20th 14er summit out of 54, and the goal that I set back in 2009 was slowly creeping closer. 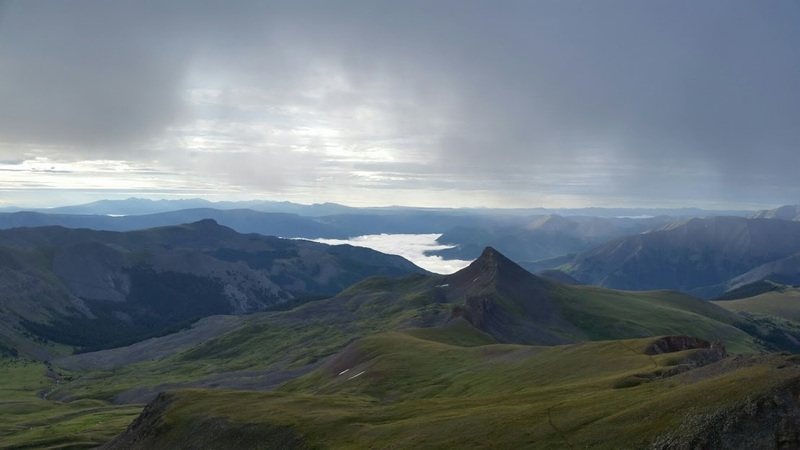 For a more detailed route description up Uncompahgre Peak check out http://www.14ers.com. It’s a great community with tons of resources that I use to plan every hike/climb. Enjoyed reading your scoot up the mountain. The cap of Unc reminds me of whatever the mountain is that the Grinch lived on in the Dr. Seuss book. Hi to David and Mel in Lake City, the town so small that residents say they take turns being the town drunk. Gotta’ love it. Climb on, guys, and say hi to the mountains from this fellow down in North Alabama.